Oh man, I wish I had remembered to post this review last week as part of a lead-up to Halloween or something. Not that I think these movies are scary, but they do try to draw inspiration from B-movie culture, which has historically involved a lot of cheesy horror movies. And you can't get much campier than with SyFy's various movies that have pit giant octopuses versus sharks and squids and who else knows what. And given SyFy's rather close ties with The Asylum, there are some deliciously bad movies out there. 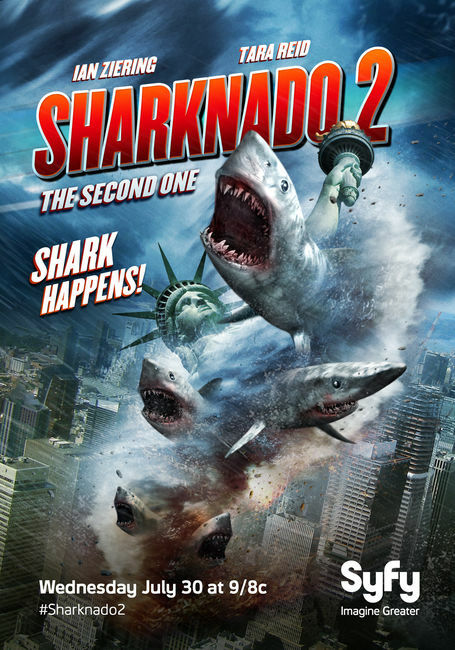 Sharknado 2: The Second One was pretty much inevitable given the social media success that was Sharknado. The success of the first movie was pretty much based in its ridiculousness. As unrealistic as the plot was, it still oddly worked and it was automatically ripe for indulgent campiness. The sequel tries to capitalize on that "it's so bad, it's good" formula and continued to try and amp up the fun with even more mayhem. And I really can't definitively say whether or not this was better than the first movie or not. Synopsis: Sharknado 2: The Second One is a TV-movie sequel to the first SyFy-released Sharknado. It was directed by Anthony C. Ferrante with a screenplay by Thunder Levin. Yes, people actually write stories for movies like this. After surviving the events of the first movie, Fin Shepard (Ian Ziering) and his ex-wife April Wexler (Tara Reid) are on a play to New York as part of a book tour for their book about surviving things like sharknados. But the plane finds itself in the middle of a storm and starts getting pelted with...you guessed it - SHARKS. It seems that yet another shark-infested weather phenomenon is happening and soon the plane loses and engine and sharks manage to break through and kill several passengers and even the pilots. But of course our heroes manage to land the plane, but not before April loses a hand to a flying shark. Once on the ground, they try to warn everyone of the coming shark-weather, but naturally people are skeptical of the truth. It sees that the events in Los Angeles didn't exactly make national news or something. At the same the same time, we're introduced to Ellen Brody (Kari Wuhrer), Fin's sister, who is in New York for the usual sightseeing and tourist bit with her family. We also end up following their survival in New York as the sharks finally arrive, terrorizing everyone. If you enjoyed the first movie, you'll still probably enjoy this one of the most part. You have all the old gags including horrible CGI sharks, confusing backgrounds that appear perfectly dry when they're supposed to be in the sun, and some very ridiculous dialog being delivered by once popular actors. It's not too hard a formula to follow, but levels of success will always vary to some degree. It feels like the goal of this movie was to find a way to get a shark into just about any New York situation. Things started off with sharks getting into a plane and the rest of the movie seems to follow this transportation focus, just like any true New York experience. Thus we get sharks on the ferry, sharks in the subway and sharks in the middle of traffic. Sharks were swooping down left and right with a lot of craziness in mind. But at the same time, some of the old tropes weren't quite as fun as they were the second time around. I can't quite put my finger on it given the movie isn't exactly mean to win major Academy Awards. It's a campy Saturday evening popcorn flick after all. But then again, I wonder if the cast weren't 100% sure of how far they wanted to push things. Just because they were trying to portray the fact that we had some folks with sharknado experience doesn't quite mean that could react a bit more or something. Maybe it's also because the plot was a wee bit more coherent, and thus it stepped away from just being ridiculous towards being bad at being serious? A lot of the movie involves them running around the city with a fairly definite plan of what they wanted to happen in order to quell the storm and get the sharks out of the city. Of course things got a little twisted around at the end, but that's all part of being a sequel. But Sharknado 2: The Second One generally delivers on what it promises - to be a good bad movie. There are still those that are more memorable, but this one still had some decent entertainment to offer. So I'll still rate this as 2 sharks getting through rush hour out of a possible 5.